Pages: 231 including watercolours, references, and bibliography. 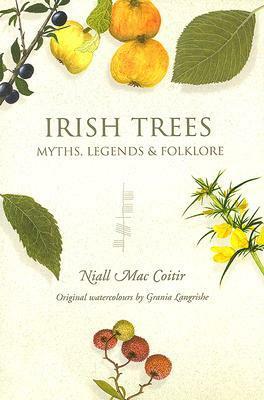 Synopsis: In ancient Ireland, mythology and folklore were part of the general knowledge about each tree. This book gathers the myths, legends and folklore associated with the native trees. In some places I kept thinking…WHAT? You read McManus on Ogams and you still think THAT? Or dear Gods you thought Robert Graves was right about THAT? (Just to be clear the author knows that Robert Graves took a lot of poetic licence in his book White Goddess but he still thought he was not wrong in some aspects). In some other places there were good and interesting tidbits but I kept thinking citation!! (Again there were footnotes in this book but in some places they didn’t materialise). I would recommend the book just for the information about the trees and the myths, legends and folklore associated with them….the rest though? I’d take that with a sign that says…caution, and please cross-reference with other books, as well as please discard in some cases. So basically, a mixed bag of good, sort of good, and UH? This is a book written in 1972 on the Irish Calendar customs. It describes how the year, with its cycle of festivals and seasonal work, was observed in Ireland in the 19-20th centuries. The author draws on a wide variety of sources and on more than thirty years of research into Irish Folk traditions. The book gives the reader an idea of how the year was for many of the inhabitants of Ireland that still followed the old traditions. You get the sense of what each strata of the community was up too at which time of the year. The book starts on Saint Brighid’s day and goes all the way to Christmas. It encompasses both Pagan and Christian days and gives the activities associated with the said day. It is a book that you can read in one go at first and then go back too at the appropriate time of year for inspiration. I really enjoyed reading the book because it gave me ideas on things that I could do on my own rituals and celebrations. It gives the sense of the ebb and flow of the year and how the seasons were related to each other and how one activity during a certain time can be related to another in another time. I think it is a must read book for anyone who is interested in following an Irish path of spirituality be it Christian or Pagan.